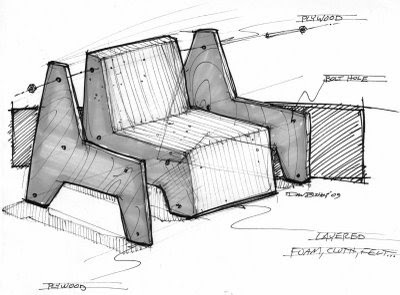 This sketch was a gray marker and pen quickie to explore and idea I had about using recycled/salvaged materials to make a chair. There would be plywood sides with the middle section made up from cardboard, cloth or foam. Bolts would hold it all together like a furniture ice cream sandwich. I like this one--really cool. It is awesome to be able to design/think/invent as you draw. Keep up the good work!